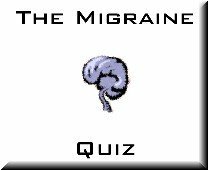 Are you ready for the Migraine Quiz? These 15 simple true and false questions are designed to see how sensitive you are to someone who is suffering from a migraine attack. When you're ready to start, just click the graphic below! Important: The free Adobe Flash player must be installed in your browser for this quiz to work. If you're having problems, please visit Adobe to download the player. If you want to link to the quiz or send your friends here, please link to this page, since the actual quiz file may change. You are free to use the graphic above or the smaller one below to link to the site, or use a text link.